Tutti Designs: Angels Rejoice - The King Has Come! Hello Tutti fans! Autumn with you today to share a cute as pie Christmas card featuring our lovely new Angelic Window die. I absolutely love making inky backgrounds with my Distress products and stamps. I was using the above panel to make an inlaid card with our Birthday Present die for a post on my blog tomorrow and decided to double up and use the cutout for this sweet card. I ever so lightly sponged my angel die with Frayed Burlap to help it blend with the grungy background. I added a sentiment sticker and a loopy organza bow. As a final touch, I removed the star from the off cast off, sponged it and mounted it higher than the die cut panel for extra dimension. 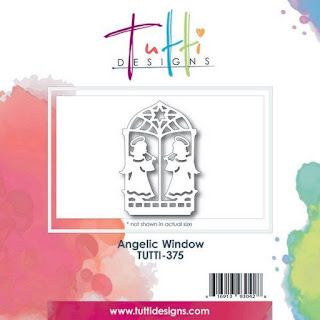 and purchase your Angelic Window die HERE today! Love your background - thought it was patterned paper!! Perfect for this sweet die - hugs! A sweet card, made even more special with your hand designed paper and popping up the 'waste' star'! Sweet die!